When Ruediger and Maryann came to Costa Rica, they didn’t want to leave. Ruediger is from Austria, Maryann from the Philippines. Yet they are very much New Yorkers. Always on the move, they wanted a special vacation home where they could take a break from time to time. He’s very busy in the financial sector. 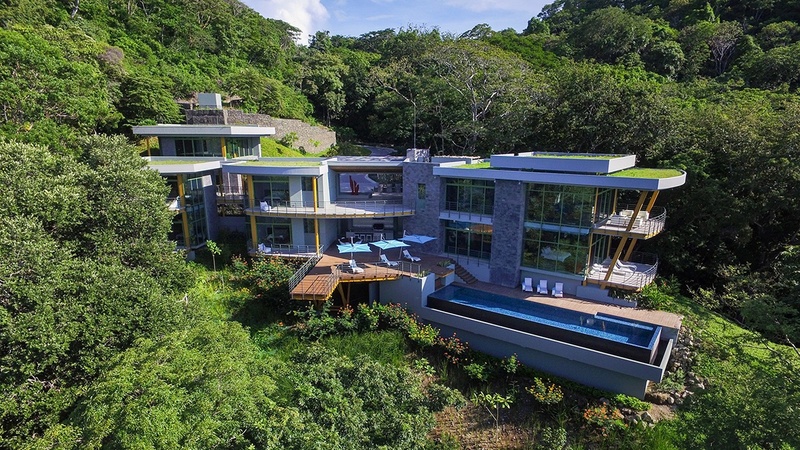 We worked together as they traveled to New York, Shanghai, and London … and built this tropical modern luxury home in Costa Rica with only four in-person visits from the clients. All other communication was done remotely. It’s truly a testament to the power of technology. My team integrated additional tech tools for communication, with a dedicated web-based hub with our clients. We’d upload 3D models with updates on the design: the level of detail is incredible, down to every single tile in the bathroom. The home is both designed and built by us, a great example of our full design-build spread of services. Now, every project has its challenges. The first challenge here was a difficult site. That’s where our integration of 3D modeling was a key component, in being able to design a home that works with the shape of the land. The property had a sharp 20-meter drop between the road front and a small linear ridge in an east-west direction that was selected as the location for the main social spaces and private master suite wing, and the rest of the house was laid out to follow the natural shape of the land as it turned into a hillside at about 45 degrees to the ridge. The entire shape of the home seems as though it grew out of the land. I like to work with nature, not against it. When I see a natural mountain, I do everything in my power not to touch it. Let me perch something naturally on top it, I think. Let’s not just get a backhoe.